Let’s firstly review why in my opinion it is important not to forget about the damage that inflation can do to your savings. The Bank of England has a remit “to deliver price stability – low inflation – and, subject to that, to support the Government’s economic objectives including those for growth and employment. Price stability is defined by the Government’s inflation target of 2%.” If January 2013 sees the Consumer Price Index (CPI) remain above 2%, and at 2.7% today I see no reason why this won’t be the case, then this will be the thirty eighth month in a row that they have missed their target. This demonstrates that the Bank of England’s remit actually has nothing to do with the official line presented. If it did they would have been made sacked for poor performance long ago. I therefore take inflation seriously. If you believe that the CPI provides an accurate measure of inflation, and had the Bank of England met their remit of inflation at 2%, then £1 three years ago would have had the purchasing power of £0.94 today. Instead the current policy employed by the Bank of England, of keeping the patient flat lined at 0.5% combined with plenty of QE, means that your £1 actually only buys £0.90 worth of goods and services today. That’s a 10% loss of purchasing power in only 3 short years. 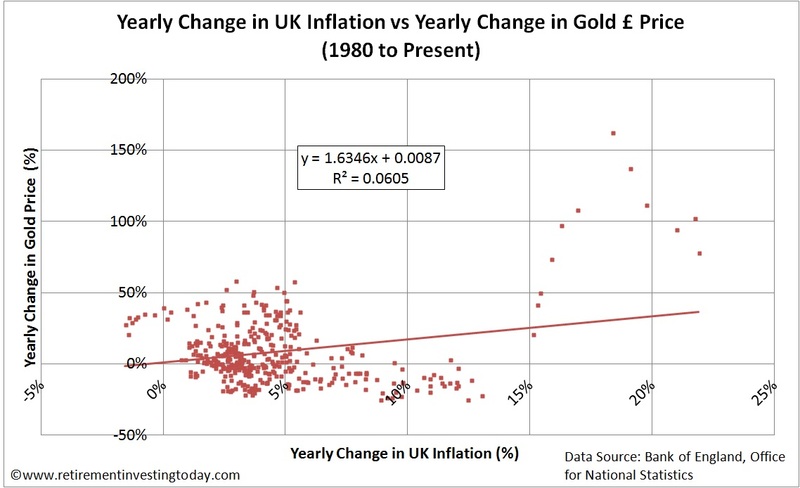 I’ve already laid out some techniques I’m using to protect myself from inflation however let’s now look if gold could be added to that list for UK Investors. Let’s first look at the chart that prompted Faustus’ comment which I show below. 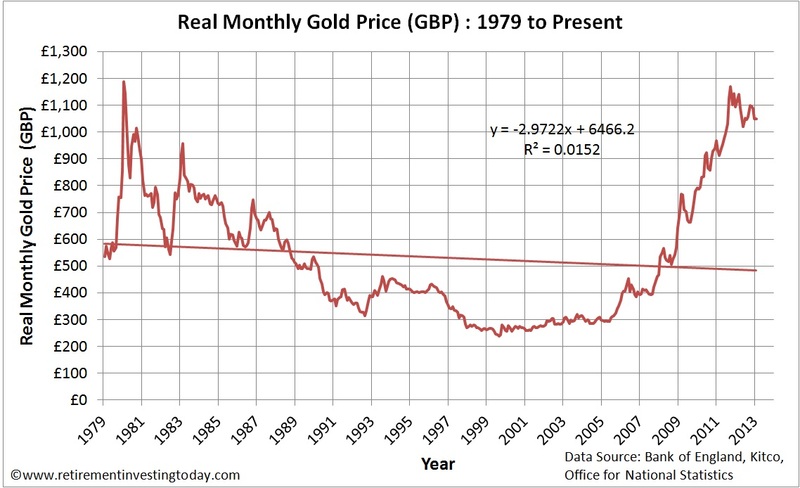 This shows the Real Monthly Price of Gold Priced in £’s. Were Gold a good and well correlated hedge for inflation for UK Investors then we should see a perfect horizontal line. It looks nothing like that so is worth further analysis. Since January 1979 (the age of my gold priced in £’s dataset) to December 2012, Gold when priced in £’s has shown an annualised return of 6.8%. In comparison my preferred measure of inflation, the Retail Prices Index has risen by an annualised 4.7%. Shift the starting year forward by just a single year and that Gold annualised return drops to 3.8% compared with inflation rising by 4.1%. This I believe starts to show the problem. Before I start to get flamed by evidence that a loaf of bread in King Nebuchadnezzar’s time (600BC) cost the same in Gold terms as today, or that in Roman times (1AD) a toga, wool coat, sandals and belt cost 1 ounce of Gold with the equivalent attire of today also being able to be bought for one ounce, I should point out that I’m aware that gold has been a hard asset and store of value for thousands of years. I also don’t doubt that over a very long run when averaged out gold could be a good hedge for inflation. It should continue to rise in value as the currency it is measured in devalues. The problem is that investing doesn’t work exactly like that. We don’t have hundreds or thousands of years of time for it to all average out. 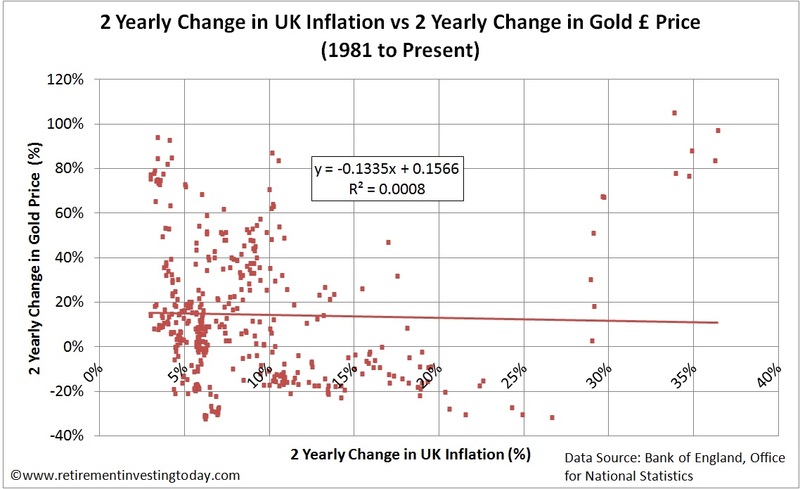 The above simple example shows that even over an investment period of 30 odd years, that just a 1 year shift in buy time could possibly get in the way of protecting you from inflation because of Gold’s significant volatility. Thinking through the last statements it also begins to show another problem with Gold. It is just a metal that sits there and doesn’t produce anything. Over a very long time the two examples above demonstrate that with Gold you can expect a real inflation adjusted return close to zero. Think about that as an investor trying to save for retirement. You would have to plan around receiving no real return on your assets. That’s a fairly scary proposition. Most of us aren’t Connor MacLeod so let’s look over a shorter period at whether Gold can protect us from inflation. My second chart below shows the annual change in inflation (RPI) compared with the annual change in Gold prices. The Coefficient of Determination for this dataset is 0.06. This means that only around 6% of the change in gold price can be explained by the change in inflation. 1 year is a short time in an investors lifetime however if there is a relationship between gold prices and inflation then as we lengthen the duration being measured we might start to see correlation improve. Let’s also therefore look at 2 and 5 year periods which are shown below. On the 2 year scale 0% of the change in gold price can be explained by the change in inflation. On the 5 year scale it’s 2%. 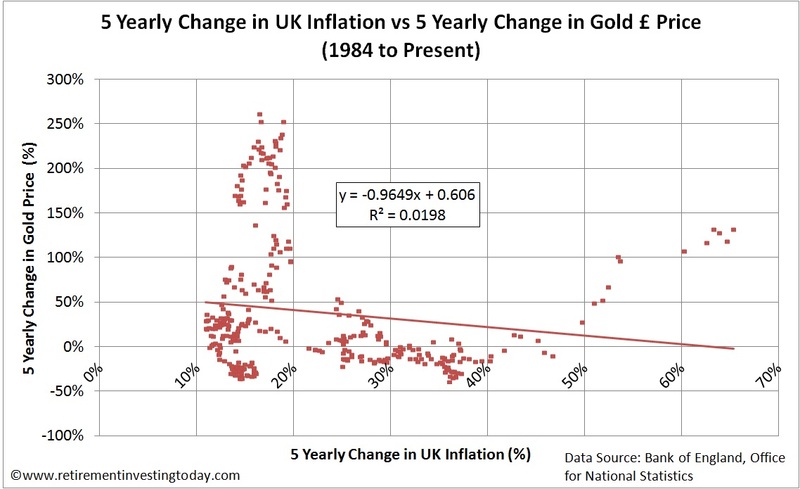 This analysis shows that over shorter periods of time gold does not provide UK Investors a good hedge against inflation. The price of gold is being affected by much larger factors. That said I choose to hold a small percentage of gold within my personal investment portfolio. It’s not there for inflation reasons but simply because it’s volatile, is in my opinion a commodity that can be held in such a way to prevent contango/backwardation and has a different correlation to my other asset classes. Over time this should enable me to continue with my strategy of buying the most underperforming asset class (which coincidently is currently gold) while selling the most over performing asset class according to my rebalancing strategy. Of course as always please do your own research. On this topic there is certainly a lot of it out there including a lot of different opinions. Do you hold gold in your own portfolio? If you do I’d be interested to know why. - because it is not someone else’s debt. Thanks for sharing Anonymous. If you're holding as insurance against the financial system collapsing I assume you're holding physical. I'd be interested to know whether you're holding physical in a safety deposit box (or similar) or whether you're holding a physical ETF such as PHGP? I'm personally holding the ETF for my 5%. Mostly as you say, for it's non-correlation to other assets in my portfolio, but later I slowly realised for all the reasons Anonymous states above. I might also add, inter-generational maintenance free store of (approximate) value and asset of last resort. Although to realise all the benefits apart from non-correlation you need to hold the actual thing. I still wonder why the government makes it so easy to hold the physical metal in the form of sovereigns e.g a tax free pre assayed form. Paradoxically I don't actually like gold because it never increases in value for positive reasons, I hope never to benefit from it. Also thanks for sharing. Similar question to the one I asked above. I'd be interested to know how you are holding your physical if it's an insurance policy as mentioned by Anonymous 1 above. I think a small amount of gold is useful for insurance, and it is probably an easy win over the medium term when it comes to diversification, too. Beyond that, massively over-hyped except if you're (un)lucky to be living in certain historical epochs. Again we seem to be similarly aligned. I'm also not a "Gold Bug" with my lowly holdings of only 5%. However I will say that those holdings have definitely added diversification and have helped squeeze additional return from my portfolio when compared to a sensible benchmark. So far as non-correlation, I held a small amount of precious metals etf in 2008. When the storm broke at the end of the year, everything - including gold/silver dropped and stayed low for months. I will stick with my income yielding equities thanks. btw, I don't really understand all the profile options?? Great to hear from you. Are you holding any commodities (whether gold or otherwise) at this point in time or did you sell out prior to the end of 2008? PS: Re the Profile Options. Unfortunately it's the standard Blogger options which I don't believe I can change. If you choose Name/URL you'll be able to enter your name (just leave the URL space blank) which I think will give you what you want. In 2008, I held a precious metals etf. It fell around 15 - 20% by the end of the year and my shares were down around 22%. Of course, the following year everything bounced back up again - the gold/silver etf and shares both over 30% - bit of a white knuckle ride! By the end of 2009, I had sold the etf and was moving more towards higher yield investing with shares and investment trusts. The closest I come to commodities at present is the Blackrock Commodities Income IT and BHP Billiton which has provided a very healthy rising divi over many years and rode out the storm without a cut. I think these two would be as far as I would personally want to go at present. ps hope you got the new book! @monevator - Overhyped ? Not sure, I found it quite hard to find out how and what to buy. Selling clearly is a different matter, for the time being. In my limited experience of holding a more widely diversified portfolio I've been consistently wrong about which asset class is going to do what, when. I 100% agree with your statement "I've been consistently wrong about which asset class is going to do what, when." It's the very reason I gave up trying to "trade" and went with the non-emotional, mechanical, low expense, diversified investing option. Oh BTW WRT to the original point. I sort of understood that the link is to the state of the current major reserve currency. So negative real interest rates on the USD push the gold price up. Also the fear factor rise in gold price represents a flight from the USD to gold. Many thanks RIT for this excellent analysis in response to my original question. It certainly confirms my doubts about the sense of holding a large % of gold in one's portfolio. Like all assets there will be a good time to buy when the price is depressed, but that does not describe the current situation. No problem at all. It was a great question that a Google search showed hadn't really been answered for UK Investors. I'm trying to learn as much as possible on my journey to financial independence and it's engagement with readers like yourself in the Comments (plus excellent Guest Posts from readers like John Hulton) that make all the effort that goes into this Site worthwhile.